Viplav asked her the reason. She said that she felt something wrong would happen. He stated that she was sad because she would be living one day without him. Shalu told her family that she had accepted Raja her husband and wanted him to fill her mang now. Raja said he was glad and wanted her but not to take this decision as the family was against it. She said she couldn’t live without him. Viplav asked Dhaani not to be sad as he would stay with her. Shalu threatened to cut her wrist. Raja asked her not to kill herself. Dashrath and Kanak got tensed. Shalu stated she couldn’t see them leaving and inquired if he was filling mang or not. Raja said no as this was wrong. Shalu cut her wrist, and everyone was shocked. Viplav told everyone that he would stay with Dhani today. Shalu asked him again. Raja said if this was her wish and filled her mang. Dhani asked Viplav to inform the family. Just then he got a call that Shalu tried to commit suicide again. Dhaani said to come. He said to stay to complete the ritual. Dulaari requested Viplav to take Dhaani and ritual could be completed later. They left. Dulaari said to Badi Amma what happened to Shalu that she was insisting on marrying Raja. She stated that if she would marry, Raja would become Damad and would increase problems of Dhaani. They got tensed. Shalu, Raja, and others went to Temple. Panditji told them to exchange garlands while he recited mantras. Viplav called Dashrath, but he didn’t pick. He said to check out where the family was. Panditji declared that marriage was completed. They all went home. 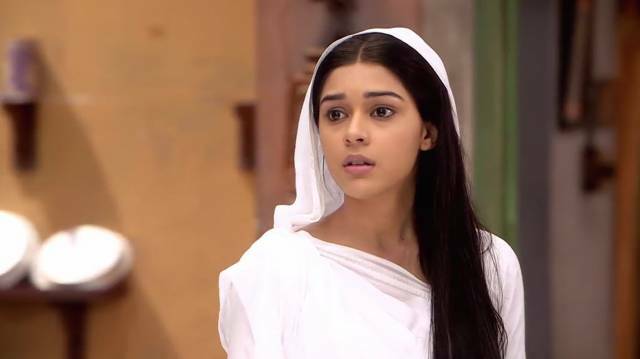 Viplav and Dhaani were shocked to see them married. Viplav got angry and beaten him up. Kanak scolded him to beat his Damad. Shalu told that he was her husband now. Dashrath asked Viplav to accept marriage as to respect his decision. He denied. Dashrath said that he had also accepted his marriage with Dhaani. Viplav again denied. Dhaani asked him not to get angry. Dashrath told Raja’s family that they would respect them with all the ritual and asked Dhaani to welcome them as Choti Bahu. Viplav held her hand and stared her with refusal. Dhaani removed his hand and welcomed them. Shalu said no need. Dhaani does the Arti. Dashrath told the couple to touch Dhaani’s feet. Dhaani stepped back. Dashrath asked the reason. She stepped forward again. Raja reached her feet with a bad touch. She felt bad.